Hanover Engineering was retained by Lehigh Valley Industrial Park (LVIP), Inc. as their site engineer for the design and development of a 254-acre light industrial and office business park. The park is located on the LVIP VII Saucon Tract in the City of Bethlehem along Route 412, south of the Lehigh River and west of Shimersville Road. The park was designed with 28 lots, two detention basins, and approximately 8,700 linear feet of new roadway. Site utilities, including stormwater management facilities, were designed and constructed to serve the development. Hanover Engineering provided LVIP, Inc. with engineering services for all aspects of the site’s stormwater management design. Work consisted of analyzing the existing stormwater management features, including inspecting and providing recommendations for the rehabilitation or the abandonment of several existing outfalls conveying runoff from the site and discharging to the Lehigh River or Saucon Creek. A new conveyance system was designed to collect and convey runoff from the proposed roadways and future lot development to the culverts. 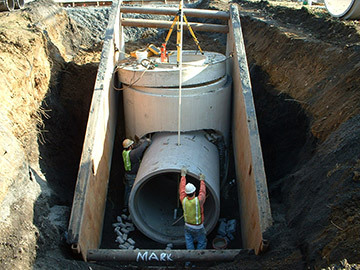 Hanover Engineering provided observation and construction management services during the installation and/or repair of the stormwater improvements for the site. The project also involved coordination with PennDOT for the adjacent Route 412 Corridor Improvement project, which was being designed at the same time as the industrial park. Coordination between the two projects was particularly important for the stormwater improvements required on PA Route 412.